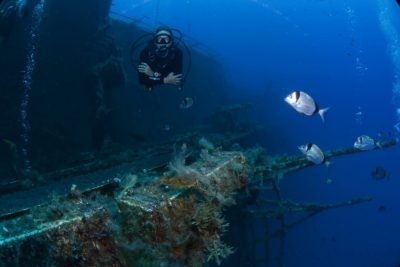 the Zenobia Wreck Week - in 2015: 23rd July – 30th July. Be prepared to spend a few days diving here, as one dive is simply not enough to fully appreciate this huge wreck. It is 172 metres long and 25 metres wide, and lies 43 metres deep at its port side on the seabed. diving is approximately 26 to 40 metres. Its gross registered tonnage – at 12,000 – testifies to the massive size of the vessel. divers. 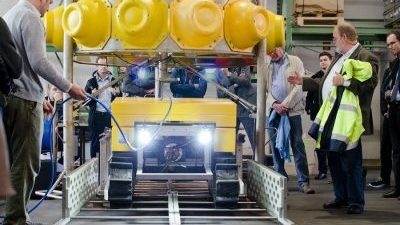 They can safely explore the upper section of the wreck without encountering any problems. thus creating a mesmerising ambience. 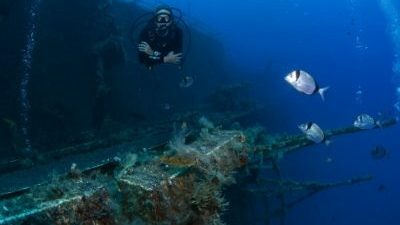 After 35 years on the seabed, the ship's hull is heavily overgrown with vegetation, and has become part of the marine habitat, serving as a home for many fishes and invertebrates. Divers who revel in macro photography would find many wonderful photo opportunities here. gunboat and even a downed helicopter. In addition, on dry land, there are a number of grottos, caves and canyons that provide welcome change on this Mediterranean island.